I love sharing our themed book lists with you. Now that the Lil Divas are "readers", we are finding ourselves reading many more beginning readers and chapter books together. I'm sure many of you are in a similar situation. By sharing our book lists with you, I hope to make finding appropriate books for your K-2nd graders easier. 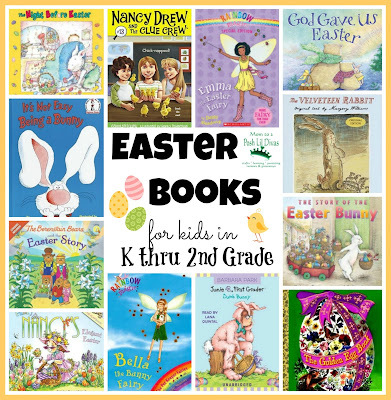 These are our favorite Easter Themed books focusing on the story of Easter, bunnies, eggs and chicks! Fancy Nancy's Elegant Easter - This is a lift-the-flap book. While most books in this style are geared towards tots, this one is perfect for your kindergartener because in true Fancy Nancy style, she uses "fancy words" like elegant, divine and gala. This one has no mention of religion. It's all eggs and bonnets and Easter parties. My kindergartener loves this fun book. The Berenstain Bears and The Easter Story - If you are looking to explain the "real meaning behind Easter versus eggs, bunnies and candy then this book is for you. Mama and Papa bear share the story of Jesus' resurrection in a kid friendly manner. It even comes with some stickers. The Night Before Easter - The Lil Divas always enjoy these "night before" books in the style of Twas the Night Before Christmas. This one has the same rhythmic language and follows the Easter Bunny as he delivers his eggs. The Story of the Easter Bunny - Have your kids ever asked questions about the Easter Bunny? This book gives a delightful explanation of how the Easter Bunny got his "job". We love the illustrations in this story. It focuses on giving and helping others which is a message we all try to impart on our children. The Golden Egg Book - This one is great for beginning readers to read independently. It's a classic story of wonder and friendship as a little bunny finds an egg and wants to learn what is inside. The bunny is so child-like in his wonder (he imagines a boy and an elephant inside!) and children will be drawn to his antics as he tries to crack the egg. It's Not Easy Being a Bunny - This isn't an Easter book per say but it fits with the bunny theme surrounding Easter and it's short, repeating text is great for beginning readers in this age group. P.J Funnybunny is tired of being a bunny so he sets out to see what else is out there. Of course, he ultimately learns that it's best to accept who you are. Kids will enjoy reading this one over and over again. God Gave Us Easter - Papa Polar Bear explains how Easter came about in a clear and simple way. A wonderful story to help children understand the real meaning of Easter, in text that younger readers can read independently or with minimal assistance. Junie B., First Grader: Dumb Bunny - Don't let the word "dumb" in the title (or the usual Junie B. name calling and bad grammar) stop you from enjoying Junie B. with your kids. She is as spunky and hilarious as ever and my Oldest Diva loves these books. You have to decide if this series is right for you and your child. Personally, I choose to focus on the fact that these books keep my daughter excited about reading with their humor and teach a lesson in a non-preachy way while Junie B. usually redeems herself in the end, as she does in this laugh out loud book. Confession -I caught myself whole heartedly laughing as we read this story. Bella the Bunny Fairy (Rainbow Magic: The Pet Fairies #2): If you have a girl in your home, you probably know about the Rainbow Magic series and if you don't - you will very soon! These books are very predictable but girls devour them. The Oldest Diva is a huge fan of the series, of which there are quite a few. In this series, Jack Frost (the meanie) has stolen the Pet Fairies' magical pets. Luckily the pets managed to escape into to human world. This particular book is about Bella and her magic bunny - the Easter bunny? I won't give it away completely but I will say it was a fast read, a cute story and involved easter egg hunts, chocolate eggs, a fairy, a magic bunny and some pesky goblins. Nancy Drew and the Clue Crew: Chick-napped! #13 - The Oldest Diva is a big Nancy Drew fan. We love this series with smart and feisty girl lead characters, tales of friendship and of course mysteries to solve. In this book, Nancy's class is hatching chickens only to have them vanish. The Clue Crew takes on the case. The girls ultimately uncover that it was a classmate but I'll let you read the book to find out who, why and how it all happened. Rainbow Magic (Special Edition): Emma the Easter Fairy - A special holiday edition book to the Rainbow Magic series. This one introduces us to Emma, the Easter Fairy. Jack Frost and his goblins are at it again. This time Emma's magic eggs are missing and it's ruining Easter - without her magic eggs go bad, the chocolate is melting and the Easter Bunny is missing. Rachel & Kirsty help Emma find her magic eggs and save Easter. The Velveteen Rabbit - This classic story is great to read around Easter time. I still recall reading this as a child myself and it was a thrill to share it with the Lil Divas. The Rabbit yearns to be real and embodies unconditional love for the boy. This is a must read - do not miss book of childhood. If you are looking for Easter themed activities - check out our Easter posts and our Easter Pinterest Board. My favorite of all time is The Country Bunny and The Little Golden Shoes! You have the best holiday book collections! Will pin, tweet and sulia it! Thanks for the great suggestions. Have you read The Easter Egg Farm by Mary Jane Auch? I really love that one!